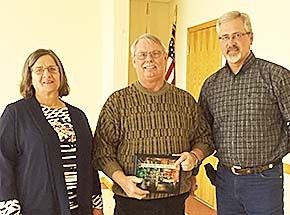 During its 176 Keys Dueling Pianos program Saturday evening, Feb. 13, the Boone County Agricultural Society honored Gale Carlson and his wife, Dorothy, of St. Edward for 19 years of service on the fair board. Gale retired from the board at the end of 2015. Gale was in charge of the antique tractor exhibits with Dorothy’s assistance. 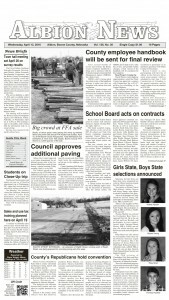 Cody Gulbrandson of St. Edward has been appointed to replace Gale on the board. Dave Noble, fair board chairman, (right) presented the appreciation plaque to Gale.